Home > Appearance > Can Male Hair Loss Be Prevented? For many men, the best anti-ageing feature is a full head of thick, glossy hair and their biggest fear is hair loss and male pattern baldness as their age. While hair loss is not life-threatening, it can have serious ramifications for a person’s self-confidence, which can then lead to others issues in life. However, the good news is that you can go some way towards preventing hair loss in men and there are now also several treatment options with potentially good results. Normal healthy hair is in a continuous growth cycle throughout your lifetime and a small amount of hair loss is normal – about 50-100 hairs a day. However, significant hair loss can be visible as hair thinning or hair shedding, when clumps of hair fall out. Many factors can induce an increased rate of hair loss – for example, stress and illness can contribute to hair loss, as well as inadequate nutrition. High sebum levels in the scalp have also been linked to malnutrition of the hair root and consequent hair loss. In ageing men, however, the primary cause of hair loss is due to high levels of the male hormone. dihydrotestosterone (DHT). DHT is derived from testosterone in the prostate, adrenal glands and scalp and high levels of DHT causes the hair follicle to degrade, thus causing the hair to fall out earlier and quicker. 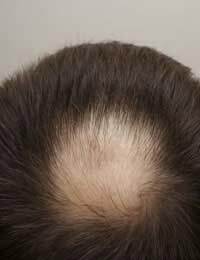 Some men have a genetically-inherited heightened sensitivity to DHT in certain parts of their scalps and therefore are more prone to male pattern baldness as they age. Male hair loss can also be affected by dietary triggers. For example, it is believed that a diet high in fats leads to an increase in DHT – as evidenced by the fact that societies on low-fat diets (such as pre-World War II Japan) showed almost no male pattern baldness and these same societies began exhibiting an increase in male pattern baldness as they began consuming a more Westernised high-fat diet. Similarly, Asian and African men on traditional diets in their own countries suffer very little male pattern baldness but begin to develop male pattern baldness when they move to North America. Can Male Hair Loss be Treated? For those seeking a non-surgical option, there are now a multitude of products claiming to be effective treatments for hair loss, although only two hair loss treatments have been approved; these contain either minoxidil or finasteride. While they can be effective in preventing further hair loss and may even help the regrowth of hair in some men, their drawbacks are that they must be used indefinitely to prevent new hair falling out. Mechanical hair restoration is another alternative – this refers to a group of surgical hair replacement procedures for treating hair loss, including hair transplant grafting, flap surgery, scalp expansion and scalp reduction. However, like many surgical procedures, these have risks and side-effects of their own. Since prevention is usually better than cure, it makes sense to look for ways to prevent hair loss before it occurs. While a large part of hair loss is hereditary, there are several preventative measures you can take to maintain a healthy scalp. For example, avoiding or limiting foods and drinks high in alcohol, caffeine, nicotine and sugar can help greatly in hair loss prevention. Similarly, avoiding cholesterol-rich foods, which are linked to increased DHT levels, will also help. Salt has also been linked to hair loss so restrict your sodium intake and make sure that you always use salt with Iodine as the latter is a nutrient vital for hair growth. Since hair loss can be caused by inadequate nutrition, a balanced, healthy diet overall can ensure that your body receives the right type and amount of nutrients needed to maintain a healthy scalp. In addition to dietary factors, other hair loss prevention methods have been suggested. These include massage and aromatherapy, which have been used with some success, and even Chinese Qi Gong, which is used to increase circulation to the scalp and face. Finally, remember that hair restoration is not an overnight process and any restorative process takes time. So follow the tips on hair loss prevention and be patient!